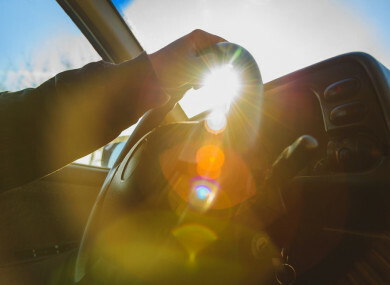 Sun glare can cause problems for drivers. MOTORISTS HAVE BEEN advised to take extra caution during what is forecast to be the hottest week of the year so far. Temperatures are set to hit the high 20s this week, Met Éireann has said. In a statement released today, AA Ireland said: “Although a week of sunshine is most definitely welcomed, the change in weather can pose extra challenges for motorists. The organisation said high temperatures can result in “an increase in stress levels while driving as there are more pedestrians on the street than usual”. Conor Faughnan, AA Director of Consumer Affairs, noted that harsh sunlight and glare can make it difficult to see vulnerable road users. “We know that a week like this will see lots of kids out and about, and you never know when a child could run out on the street after a football. We also see more cyclists taking to the roads and a general increase in traffic volumes. It all adds to the danger so the advice is as always to slow down and expect the unexpected. To reduce the risk of glare, drivers are encouraged to keep their windscreen clean and replace worn or damaged windscreen wipers. Faughnan said people who are suffering from hay fever should get someone else to drive if possible. “If you must get behind the wheel, close windows and air vents to reduce pollen grains in the car and wear wraparound sunglasses to reduce eye irritation. “Make sure any medication you’re taking doesn’t cause drowsiness and clean mats and carpets regularly to get rid of dust,” he added. Faughan said that, as well as paying extra attention to their own driving behaviour, motorists should make sure their tyres and engine are in good condition. “If tyres are in poor condition then this sort of weather will really test them. Make sure you check tyres regularly, for condition and pressures, and increase pressures to suit extra loads,” he advised. High temperatures can also put a heavy demand on a vehicle’s engine components. It’s advisable to check the coolant and cooling system regularly to avoid overheating, as well as checking the engine oil, transmission fluid, power steering fluid and brake fluid to make sure that they’re all at the recommended levels. According to the AA Rescue team, more breakdowns occur in the Dublin region around beaches and lakes than other areas at this time of year. There is also a tendency for the number of breakdowns to increase in areas such as the southeast and west during good weather. One of the most common reasons for an AA Rescue call-out is the air condition run-off being mistaken as a water leak from the car. Email “Drivers advised to take extra caution during hottest week of the year”. Feedback on “Drivers advised to take extra caution during hottest week of the year”.